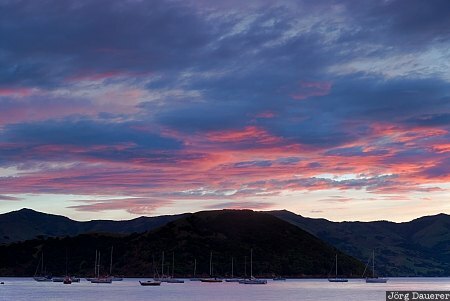 A spectacular sunrise above the hills of the Banks Peninsula at Akaroa Harbour with some boats in the foreground. The Banks Peninsula is in eastern Canterbury on the south island of New Zealand. This photo was taken in the morning of a cloudy day in November of 2008. This photo was taken with a digital camera.